In 2004, it was national news when lawyer Nathan Sawaya left his six figure lawyer job to become a LEGO Master Builder. Six months later, he left that job to become an independent LEGO builder and start creating art. Ten years later, his brick art travels the country in exhibits and recently a book of his exhibit was released by No Starch Press – The Art of the Brick: A Life in LEGO. Here in New York, The Art of the Brick exhibit was on display in Times Square. The life size and larger sculptures were on display for the masses to explore, view, and even contribute to one of the pieces. Unfortunately, not everyone can get to see the exhibit live, but for those who cannot, The Art of the Brick: A Life in LEGO is a beautiful hardcover book to view these sculptures. While it may not have the same impact as seeing them in person, the pictures give a really good look at the pieces and gives perspectives and angles on some of the pieces that may not even be seen in a gallery. Each piece in the book is given several pages to not only get a good look at the LEGO sculptures, but to give background on them as well. Each is accompanied by personal stories behind the scenes that either led to the creation of the sculpture or is some personal connection to the piece. 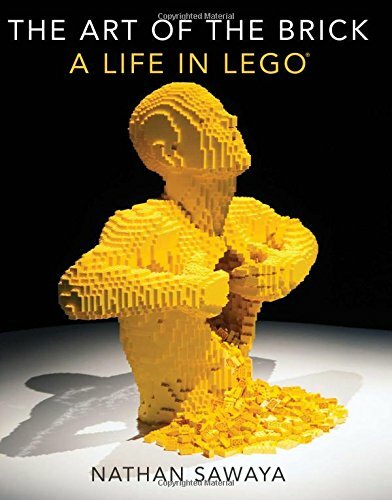 Whether it was a television appearance or something in his family’s history that connects him with a piece of history he has recreated, it gives the book a more personal feel, rather than just a book of LEGO pictures with some instructions. Nathan Sawaya’s LEGO creations are impressive to behold. If you have never seen Nathan’s LEGO sculptures in person, it is inspirational to see what an artist can do with simple LEGO bricks. If you have seen them in person, The Art of the Brick: A Life in LEGO gives a whole new perspective on the pieces and gives the reader a personal connection to that goes beyond the children’s building toys that the once started out as.